Since starting Emphatic Hands, I have tried to find a way to write about things I like in brief. That rarely works out. But I’m going to try it from now on, once a week, every Tuesday. (Haha, I hope.) “Emphasis On” – shut up, I needed a title – will consist of brief, one-paragraph reviews of books, music, films or television. Last week, I talked about Gary Shteyngart’s Little Failure. 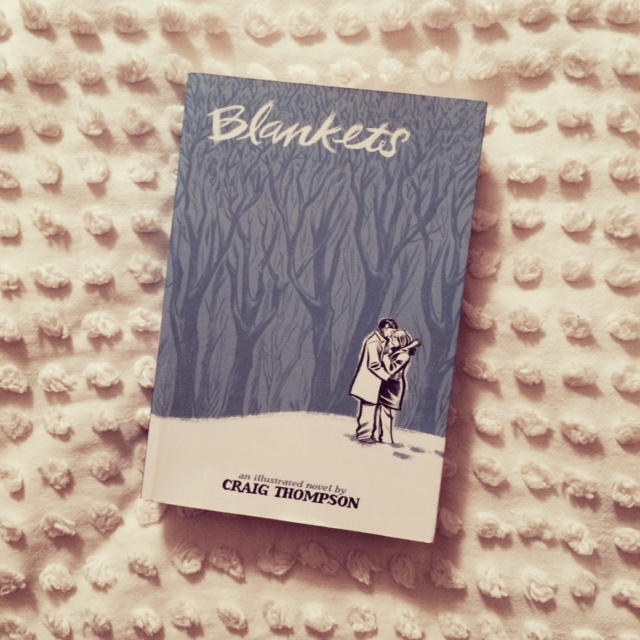 This week, I’m talking about Craig Thompson’s graphic memoir, Blankets. I first read Blankets several years ago, while on a quest to read all of the best graphic novels. (I believe I chose this one after reading Watchmen for the first time.) At the time, I was blown away. I read the whole thing in one sitting. A brief synopsis of the book: Craig grows up in rural Wisconsin in an evangelical Christian family, is bullied throughout his childhood and adolescence, falls in love for the first time, and struggles with his faith. The autobiographical novel follows Craig from childhood to young adulthood. I found that I could relate to all of his experiences, from evolving sibling relationships to feeling guilty for not being exactly who you thought you were supposed to be, even though my life and opportunities have been very different from Thompson’s. Upon my recent re-reading of the book, I fell in love with it all over again. I definitely recommend this to…anyone, really! But especially those who are looking to start reading graphic novels or enjoy coming-of-age stories.